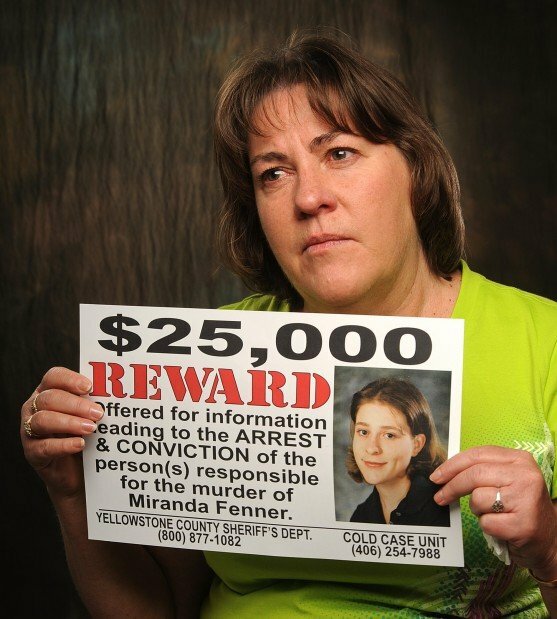 Sherry Fenner talks about a new round of reward posters she is distributing as she seeks information about the 1998 murder of her daughter, Miranda. Miranda Fenner reward poster. September 4, 2012. 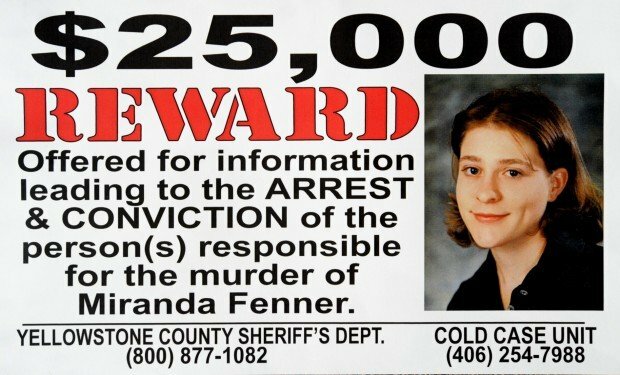 Every time Sherry Fenner gets a tip or a new bit of information on the 1998 murder of her daughter, Miranda Fenner, it's tough. But each little piece is worth it if it helps bring her and law enforcement closer to finding the killer. "A few tears and a few hours of heartache is nothing compared to what she went through, with Miranda's case," Fenner said. With that in mind, Fenner has spent nearly 14 years making sure her daughter's case has stayed in the public eye, and it's getting a renewed boost, both in public awareness and from investigative efforts. It is one of the highest-profile unsolved murder cases in Yellowstone County and has caught national attention — from the likes of the Discovery Channel and "The Montel Williams Show" — over the years. On Nov. 15, 1998, 18-year-old Miranda was working at The Movie Store in Laurel when somebody stabbed her repeatedly and slashed her throat. She managed to drag herself to the store's main entrance, where passers-by found her. While detectives from the Yellowstone County Sheriff's Office and Laurel Police Department have actively been working the case since, it remains unsolved. The crime's brutality has kept it in the public eye, Fenner said, but the community has also done its part. "We live in a small town," she said. "People care." She's been distributing posters and encouraging people to spread the word ever since and has now created a new poster — and vehicle decals and magnets — advertising a $25,000 reward and seeking information. The new poster and other items are being sent around the state and nation. "It's been 14 years," she said. "We haven't gone anywhere. We're not going to stop." Sheriff Mike Linder said solving the case remains a top priority for his office. In March, the newly created Cold Case Unit, designed to work on unsolved murders, redoubled the investigation. The unit takes a look at each new piece of information or tip that comes in, and there have been plenty. Fenner said she stays in regular contact with the detectives on the case and hands over letters people from across the country send her about the case. Det. Monty Wallis, who works on the unit, said people provide tips about the case regularly. That information, combined with new investigative tools such as more accurate DNA testing, is a good sign. "There is progress being made every day," he said. "We've got a lot more people calling in. I feel confident to tell you that it will be solved." Those calls could increase even more by the end of the week and throughout the fall, when Community Seven Television in Billings airs the first 30-minute episode of "Cold Cases of Yellowstone County," a series looking at the nine unsolved homicide cases in the county. The first, set to air on Thursday at 8:30 p.m., focuses on the Miranda Fenner case, looks at news reports from the time and features interviews with Sherry Fenner, Linder and sheriff's office detectives. Lynne Turner Fitzgerald, the station's executive director, said that ABC6/FOX4 in Billings and statewide public access channel TVMT, which broadcasts into 55 communities, plan to air the series, starting with the Fenner case. The hope is that somebody will see the program and come forward with new, solid information. "Even though this case is almost 14 years old, they’re still very hopeful that they’re going to find the killer in this case," Fitzgerald said. "They all believe that the killer is out there. They all believe that the killer is still around. They also believe that people out there know things, and all we want them to do is come forward." That's exactly what Fenner and investigators hope happens. Things can change over the years, and maybe somebody who knows anything, however seemingly insignificant, will feel more comfortable coming forward after a bump in public awareness. Wallis said he's convinced that there are people in the community who know what happened. Fenner urged them to speak out. "Don't decide (if it's important)," she said. "Let the law enforcement decide if it's an important piece of evidence." In the meantime, she'll keep handing out posters and keep remembering her daughter. She'll keep talking to detectives, and she'll keep hoping that Miranda's killer will be brought to justice. "We live every single day without her and I hope they live every day with the knowledge that they killed her," Fenner said. To call in tips about Miranda Fenner's murder, or other unsolved murders, call the Cold Case Unit at 406-254-7988. Anonymous tips are accepted as well. Anyone interested in getting Miranda Fenner reward posters or vehicle decals and magnets can call the Cold Case Unit or Redd's Signs and Graphics at 652-2552. For more information on Cold Cases of Yellowstone County, contact Lynne Turner Fitzgerald at 281-5080.